If running a business were easy, everyone would do it. The truth is, keeping a company afloat requires a lot of business savvy and even more tenacity. Lean and agile work for ideas big and small, as long as testing can provide you with insights relating to its success. What would you do if you became CEO of Twitter? Jason Calacanis has a seven-part plan. 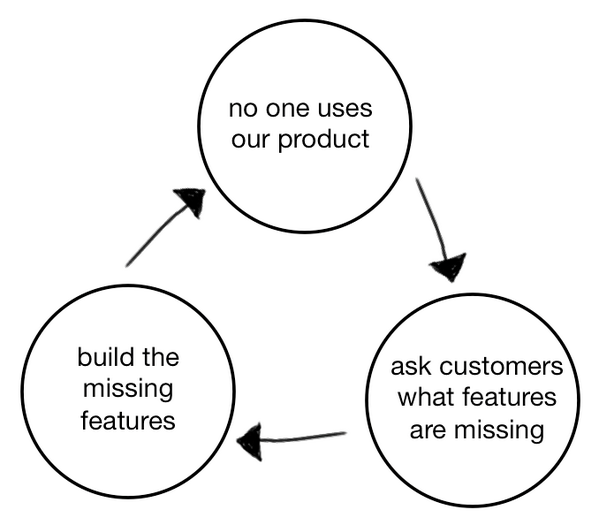 common wrong steps founders take that lead to the so-called Product Death Cycle. the wrong questions you've been asking and how to switch to the right ones. The most surprising finding in this list is that MIT has produced fewer mega-Unicorns than two tiny art schools, the Rhode Island School of Design and The Art Center College of Design. There’s no getting around it: you’re going to have some tough months at work. Things are going to get slow, favorite employees will leave, and sometimes favorite customers will take their business elsewhere. Some of you reached out to us for our opinion on Techstars acquiring UP Global. We believe that it makes perfect sense for Techstars, and that it might make sense for UP Global. We really don't know how well UP Global was doing, and if it could use the help Techstars can offer, it probably is a smart move. Could UP Global not stay independent? How can we make sure we ourselves stay independent? The Startup Foundation has never relied on grants or sponsors to date. We do have the occasional sponsors, but none that depict our course. So we might have already learned how to stay truly independent, which does mean we need to earn money in order to grow. People have asked us why we charge for #startup, and have often expressed they didn't understand why SF Experience was more expensive to take part in compared to Startup Weekend. It's not a case of us wanting to fill our pockets, but because we want to do more to grow our impact, and to stay independent. We trust that Techstars will continue to rock, especially now they have acquired some of the world's best programs to get people all the way from wanterpreneur to a succesful one. We see this as a chance to step up to become the most impactful and independent non-profit in support of founders and their startups, globally. More info can be found on this community page of UP Global Techstars. I hope you enjoyed this weeks Curated, and trust you'll help us to grow into this new opportunity. Nir Eyal explains how you can use his Hooked model to Un Hook your 'bad' tech habits. Ryan talked about his transition from product manager to CEO and offers advice [1 minute].